Focus Ireland has said the Government policy must make a much greater shift away from delivering more homeless emergency accommodation and towards delivering a lot more social housing. The charity said delivering more social housing would also help people struggling to find someone to live in the rental market as it would directly result in freeing up many units in the private rented market that are currently used for HAP tenancies. The charity also said the current situation would be much worse without the work of Focus Ireland as it helped over 400 families to secure a home last year – in partnership with the State – and move on from homelessness. However, the latest figures show that the crisis is deepening despite this good work by state agencies and NGO’s as the Government continues to shy away from tackling the deeper issues which are driving more people into homelessness. “Families need homes not more hubs. We know this can be done as Focus Ireland provided over 150 homes last year in partnership with the State and through the support of our donors. However, the Government is still not delivering enough social housing and we are in very real danger of the short term fix of homeless hubs becoming a long-term situation. Government figures show that too many local authorities are failing to meet the social housing targets, and where the target is met that only highlights how inadequate the targets are as they are far too low given the critical demand for such housing. Governments in the past were able to deliver social and affordable housing much more effectively, even when the country was much poorer than it is today. We need greater ambition and greater delivery of housing. Meanwhile, Focus Ireland said that its own figures show that the numbers of families becoming newly homeless each month in Dublin has nearly doubled in one month rising as 95 families became newly homeless in Dublin in January compared to 50 in December. Focus Ireland said that each year there is normally a seasonal drop in the number of people who are homeless in December and then a spike in the numbers in the January or February figures. This is due to a number of reasons such as extended family taking in people over Christmas but the situation is not sustainable and the families return to homeless accommodation after a short period. Focus Ireland also noted that these figures do not include all those families who have been assessed as homeless by local authorities and are receiving homeless support funded by the Department of Housing. 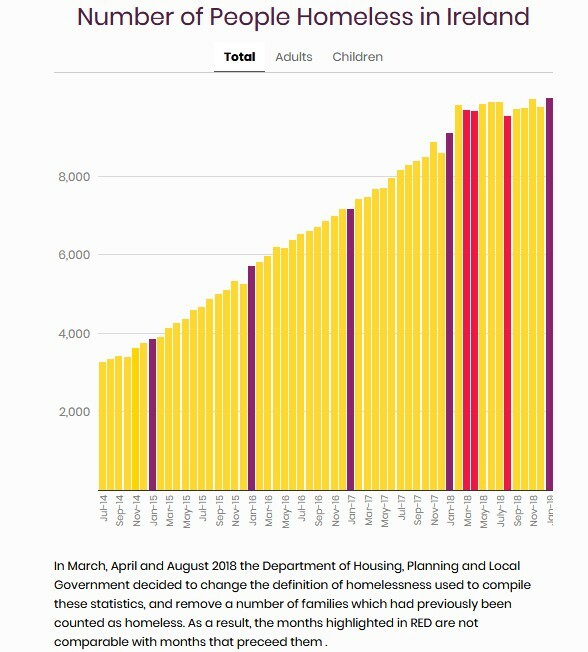 The Minister’s still unexplained decision to exclude from the monthly figures homeless families who are accommodated in premises ‘with their own front’ door means that the monthly figures show only part of the problem. Focus Ireland called on the Department of Housing to publish the number of families living in ‘own door’ emergency accommodation, which is the practice in England and Scotland where similar properties are used to accommodate homeless families. Focus Ireland has also again called for two key actions which must be taken by the government to help ease the crisis. Develop a specific family homelessness strategy given the scale of this crisis. Focus Ireland has called for the government to introduce a specific sub-strategy for addressing the needs of homeless families. There must be a real impetus when there are children and vulnerable people involved, and we think there has been a failure to grasp that by the government. Set a cast iron deadline that no family or person will be homeless for longer than six months. This will require new measures to prevent men, women and children losing their homes and improved measures to help those who are already homeless. Many are trapped in hotels or bed and breakfasts in one room with their children.